Lewis Hamilton beat Mercedes Formula 1 team-mate Nico Rosberg to the quickest time in final practice for the inaugural grand prix in Baku. 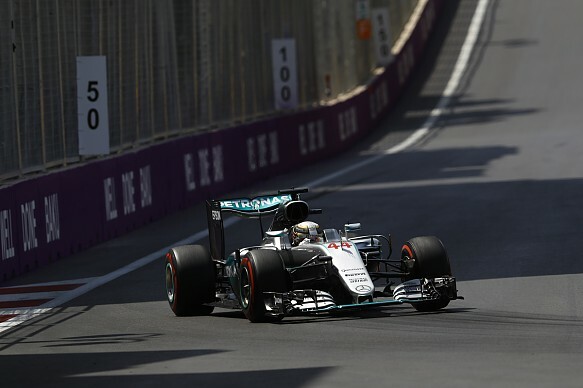 Hamilton clocked a 1m44.352s on super-softs on his qualifying simulation to finish 0.258 seconds clear of Rosberg. It was a scrappy session for the champion, who failed to string together a clean run until his final lap with just a few minutes to go, allowing Rosberg to lead much of the hour. Force India’s Nico Hulkenberg was best of the rest, 1.188s adrift in third. But while one Force India was chasing Mercedes, the other caused a last-minute red flag as Sergio Perez crashed at Turn 15 just after the chequered flag had flown. Williams had been in the mix with Force India behind Mercedes on Friday, but its Saturday got off to a bad start. Valtteri Bottas ran over a loose drain cover in the pitlane at the end of his installation lap, flicking it up and causing damage to the car. The team battled to get back him out again, but with 20 minutes to go it became clear that would not be possible. Felipe Massa got sideways and clipped the wall on an early run, and though he soon returned to the track he was only 14th fastest. Daniel Ricciardo was the quickest non-Mercedes powered car in fourth, ahead of Sebastian Vettel and Perez. Max Verstappen was seventh with Jenson Button, who complained on team radio that he was held up by Hamilton on his low-fuel run, eighth. Toro Rosso’s Daniil Kvyat and Ferrari’s Kimi Raikkonen completed the top 10. The latter lost running time when he returned to the pits citing a loss of power. Romain Grosjean, who was one of a number of drivers to slide into an escape road and had NASCAR driver Kurt Busch in the garage watching on, was the leading Haas in 13th. Manor’s Pascal Wehlein finished ahead of Jolyon Palmer’s Renault and both Saubers in 17th. The temperature ramped up in Baku on Saturday, with track temperatures 15C higher than they were in second practice.